Does having the most expensive, most efficient HVAC system in the market guarantee great comfort and savings? Not exactly! Even if you have all the best features in one unit, if it is not properly installed, you will never get the efficiency it offers. 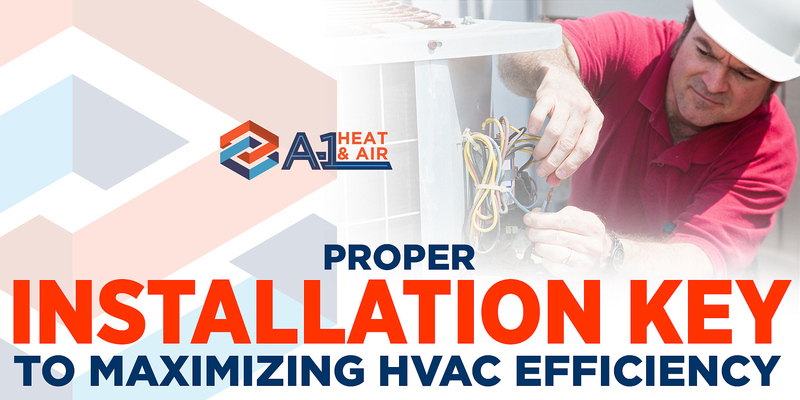 We at A-1 Heat & Air Conditioning understand that the combination of high-quality products and proper installation is crucial to attaining great comfort and savings in your home and commercial place. That is why we make it a point that every detail in our installation service is given attention. Here are three of the many things that might just happen with shoddy HVAC installation. There are different sizes of HVAC systems, and the right one will depend on the size and cooling demands of your home. Professionals use a complex formula to know the size of the unit that best fits your space. There are installers however who misapply this formula and simply guess the calculations which result in skyrocketing energy bills. A too small or too big HVAC unit will not be good for your home. It will lead to poor comfort, high energy bill, expensive repairs and early system breakdown. Air conditioning system should be charged with refrigerant that is based on its specification. This is crucial in keeping the proper operation of the unit. Undercharged refrigerants can cause ice build-up in the coils, poor cooling performance, and overheating of your air conditioner’s compressor motor. Having an overcharged refrigerant, on the other hand, can cool your home but not as efficient as a properly charged A/C. You will realize the consequences when your energy bill arrives. Proper installation should include duct inspection, repair or replacement. One of the major reasons for HVAC inefficiency is a leaky air duct. Even if you have the most updated HVAC system, if your air duct is leaking the air into your attic and the spaces of the walls, you still will not get justice to your investment. Hiring the best HVAC professional to inspect, repair or upgrade your air duct for better performance will sure make a big difference in your comfort and savings. Proper installation will keep your family safe and your home comfortable no matter what the season is. If you need expert advice when you plan for a system upgrade or replacement, feel free to reach out to our professionals at A-1 Heat & Air Conditioning.